1. If you have NO floor above the server room, you may opt for permanent solution by using mini split air conditioner. 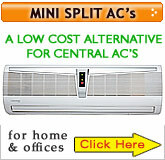 To check how mini split air conditioner work Click Here. 3. But if you have floors above the server room and you have no windows or outside wall, you have very few options. Here is your solution. You will need to buy a portable air conditioner, so you can run the exhaust hose through the ceiling. Remember there is NO air conditioner available that does not need to be vented out. The truth is all air conditioners have compressors that help blow cold air into the room. But after all a compressor is a machine or a motor and when it runs there is heat generated and if this heat is not thrown out of the room, it will end up warming the room instead of cooling the room. Which is why venting or using an exhaust hose is always required. Remember DO NOT buy "NO DRAIN REQUIRED" portable air conditioner if you will not run the hose through the window. Buy a regular portable air conditioner if you decide to run the hose through the ceiling. Single hose portable air conditioner will be a better option than the dual hose in this case. You have to remember, cold air is heavier than the warm air. 1. Place the portable AC on the floor, since the hose is only 5 ft long you can buy an extra 5 ft hose and connect both together. And attach the hose to the ceiling. To buy these single hose portable AC's with no drain, you need to buy Sunpentown brand from this page, click here.